Cardiology is a specialty of internal medicine. To be a cardiologist in the United States, a three-year residency in internal medicine is followed by a three-year fellowship in cardiology. It is possible to specialize further in a sub-specialty. Recognized sub-specialties in the United States by the ACGME are cardiac electrophysiology, echocardiography, interventional cardiology, and nuclear cardiology. Recognized subspecialties in the United States by the American Osteopathic Association Bureau of Osteopathic Specialists (AOABOS) include clinical cardiac electrophysiology and interventional cardiology. Cardiac electrophysiology is the science of elucidating, diagnosing, and treating the electrical activities of the heart. The term is usually used to describe studies of such phenomena by invasive (intracardiac) catheter recording of spontaneous activity as well as of cardiac responses to programmed electrical stimulation (PES). These studies are performed to assess complex arrhythmias, elucidate symptoms, evaluate abnormal electrocardiograms, assess risk of developing arrhythmias in the future, and design treatment. These procedures increasingly include therapeutic methods (typically radiofrequency ablation, or cryoablation) in addition to diagnostic and prognostic procedures. Other therapeutic modalities employed in this field include antiarrhythmic drug therapy and implantation of pacemakers and automatic implantable cardioverter-defibrillators (AICD). The cardiac electrophysiology study (EPS) typically measures the response of the injured or cardiomyopathic myocardium to PES on specific pharmacological regimens in order to assess the likelihood that the regimen will successfully prevent potentially fatal sustained ventricular tachycardia (VT) or ventricular fibrillation VF (VF) in the future. Sometimes a series of EPS drug trials must be conducted to enable the cardiologist to select the one regimen for long-term treatment that best prevents or slows the development of VT or VF following PES. Such studies may also be conducted in the presence of a newly implanted or newly replaced cardiac pacemaker or AICD. Clinical cardiac electrophysiology is a branch of the medical specialty of cardiology and is concerned with the study and treatment of rhythm disorders of the heart. Cardiologists with expertise in this area are usually referred to as electrophysiologists. Electrophysiologists are trained in the mechanism, function, and performance of the electrical activities of the heart. Electrophysiologists work closely with other cardiologists and cardiac surgeons to assist or guide therapy for heart rhythm disturbances (arrhythmias). They are trained to perform interventional and surgical procedures to treat cardiac arrhythmia. The training required to become an electrophysiologist is long and requires 7 to 8 years after medical school (in the U.S.). Three years of internal medicine residency, three years of Clinical Cardiology fellowship, and one to two (in most instances) years of clinical cardiac electrophysiology. Cardiogeriatrics or geriatric cardiology is the branch of cardiology and geriatric medicine that deals with the cardiovascular disorders in elderly people. Cardiac disorders such as coronary heart disease (including myocardial infarction, heart failure, cardiomyopathy, arrhythmias (as atrial fibrillation) and others are common and are a major cause of mortality in elderly people. Vascular disorders such as atherosclerosis and peripheral arterial disease cause significant morbidity and mortality in aged people. Echocardiography can help detect cardiomyopathies, such as hypertrophic cardiomyopathy, dilated cardiomyopathy, and many others. The use of stress echocardiography may also help determine whether any chest pain or associated symptoms are related to heart disease. The biggest advantage to echocardiography is that it is not invasive (does not involve breaking the skin or entering body cavities) and has no known risks or side effects. Interventional cardiology is a branch of cardiology that deals specifically with the catheter based treatment of structural heart diseases. Andreas Gruentzig is considered the father of interventional cardiology after the development of angioplasty by interventional radiologist Charles Dotter. A large number of procedures can be performed on the heart by catheterization. This most commonly involves the insertion of a sheath into the femoral artery (but, in practice, any large peripheral artery or vein) and cannulating the heart under X-ray visualization (most commonly fluoroscopy). The main advantages of using the interventional cardiology or radiology approach are the avoidance of the scars and pain, and long post-operative recovery. Additionally, interventional cardiology procedure of primary angioplasty is now the gold standard of care for an acute myocardial infarction. It involves the extraction of clots from occluded coronary arteries and deployment of stents and balloons through a small hole made in a major artery, which has given it the name “pin-hole surgery” (as opposed to “key-hole surgery”). Helen B. Taussig is known as the founder of pediatric cardiology. She became famous through her work with Tetralogy of Fallot, a congenital heart defect in which oxygenated and deoxygenated blood enters the circulatory system resulting from a ventricular septal defect (VSD) right beneath the aorta. This condition causes newborns to have a bluish-tint, cyanosis, and have a deficiency of oxygen to their tissues, hypoxemia. She worked with Alfred Blalock and Vivien Thomas at Johns Hopkins Hospital where they experimented with dogs to look at how they would attempt to surgically cure these “blue babies.” They eventually figured out how to do just that by the anastomosis of the systemic artery to the pulmonary artery and called this the Blalock-Taussig Shunt. Tetralogy of Fallot is the most common congenital heart disease arising in 1–3 cases per 1,000 births. The cause of this defect is a ventricular septal defect (VSD) and an overriding aorta. These two defects combined causes deoxygenated blood to bypass the lungs and going right back into the circulatory system. The modified Blalock-Taussig shunt is usually used to fix the circulation. This procedure is done by placing a graft between the subclavian artery and the ipsilateral pulmonary artery to restore the correct blood flow. Pulmonary Atresia happens in 7–8 per 100,000 births and is characterized by the aorta branching out of the right ventricle. This causes the deoxygenated blood to bypass the lungs and enter the circulatory system. Surgeries can fix this by redirecting the aorta and fixing the right ventricle and pulmonary artery connection. There are two types of pulmonary atresia, classified by whether or not the baby also has a ventricular septal defect. Pulmonary atresia with an intact ventricular septum: This type of pulmonary atresia is associated with complete and intact septum between the ventricles. Pulmonary atresia with a ventricular septal defect: This type of pulmonary atresia happens when a ventricular septal defect allows blood to flow into and out of the right ventricle. Ebstein’s anomaly is when the right atrium is significantly enlarged and the heart is shaped like a box. This is very rare and happens in less than 1% in congenital heart disease cases. The surgical repair varies depending on the seriousness of the disease. The primary responsibility of the heart is to pump blood throughout the body. It pumps blood from the body — called the systemic circulation— through the lungs — called the pulmonary circulation — and then back out to the body. This means that the heart is connected to and affects the entirety of the body. Simplified, the heart is a circuit of the Circulation. While plenty is known about the healthy heart, the bulk of study in cardiology is in disorders of the heart and restoration, and where possible, of function. Coronary circulation is the circulation of blood in the blood vessels of the heart muscle (myocardium). The vessels that deliver oxygen-rich blood to the myocardium are known as coronary arteries. The vessels that remove the deoxygenated blood from the heart muscle are known as cardiac veins. 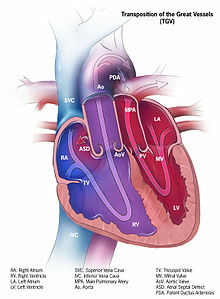 These include the great cardiac vein, the middle cardiac vein, the small cardiac vein and the anterior cardiac veins. As the left and right coronary arteries run on the surface of the heart, they can be called epicardial coronary arteries. These arteries, when healthy, are capable of autoregulation to maintain coronary blood flow at levels appropriate to the needs of the heart muscle. These relatively narrow vessels are commonly affected by atherosclerosis and can become blocked, causing angina or a heart attack. (See also: circulatory system.) The coronary arteries that run deep within the myocardium are referred to as subendocardial. The coronary arteries are classified as “end circulation”, since they represent the only source of blood supply to the myocardium; there is very little redundant blood supply, which is why blockage of these vessels can be so critical. The cardiac examination (also called the “precordial exam”), is performed as part of a physical examination, or when a patient presents with chest pain suggestive of a cardiovascular pathology. It would typically be modified depending on the indication and integrated with other examinations especially the respiratory examination. Like all medical examinations, the cardiac examination follows the standard structure of inspection, palpation and auscultation. Cardiology is concerned with the normal functionality of the heart and the deviation from a healthy heart. Many disorders involve the heart itself but some are outside of the heart and in the vascular system. Collectively, the two together are termed the cardiovascular system and diseases of one part tend to affect the other. Hypertension, also known as “high blood pressure””, is a long term medical condition in which the blood pressure in the arteries is persistently elevated. High blood pressure usually does not cause symptoms. Long term high blood pressure, however, is a major risk factor for coronary artery disease, stroke, heart failure, peripheral vascular disease, vision loss, and chronic kidney disease. Lifestyle factors can increase the risk of hypertension. These include excess salt in the diet, excess body weight, smoking, and alcohol. Hypertension can also be caused by other diseases, or as a side-effect of drugs. Essential hypertension is the form of hypertension that by definition has no identifiable cause. It is the most common type of hypertension, affecting 95% of hypertensive patients, it tends to be familial and is likely to be the consequence of an interaction between environmental and genetic factors. Prevalence of essential hypertension increases with age, and individuals with relatively high blood pressure at younger ages are at increased risk for the subsequent development of hypertension. 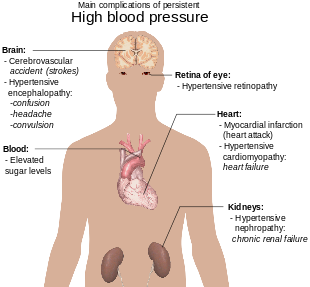 Hypertension can increase the risk of cerebral, cardiac, and renal events. Secondary hypertension is a type of hypertension which is caused by an identifiable underlying secondary cause. It is much less common than essential hypertension, affecting only 5% of hypertensive patients. It has many different causes including endocrine diseases, kidney diseases, and tumors. It also can be a side effect of many medications. Complications of hypertension are clinical outcomes that result from persistent elevation of blood pressure. Hypertension is a risk factor for all clinical manifestations of atherosclerosis since it is a risk factor for atherosclerosis itself. It is an independent predisposing factor for heart failure, coronary artery disease, stroke, renal disease, and peripheral arterial disease. It is the most important risk factor for cardiovascular morbidity and mortality, in industrialized countries. Cardiac arrhythmia, also known as “cardiac dysrhythmia” or “irregular heartbeat”, is a group of conditions in which the heartbeat is irregular, too fast, or too slow. A heart rate that is too fast – above 100 beats per minute in adults – is called tachycardia and a heart rate that is too slow – below 60 beats per minute – is called bradycardia. Many types of arrhythmia have no symptoms. When symptoms are present these may include palpitations or feeling a pause between heartbeats. More seriously there may be lightheadedness, passing out, shortness of breath, or chest pain. While most types of arrhythmia are not serious, some predispose a person to complications such as stroke or heart failure. Others may result in cardiac arrest. There are four main types of arrhythmia: extra beats, supraventricular tachycardias, ventricular arrhythmias, and bradyarrhythmias. Extra beats include premature atrial contractions, premature ventricular contractions, and premature junctional contractions. Supraventricular tachycardias include atrial fibrillation, atrial flutter, and paroxysmal supraventricular tachycardia. Ventricular arrhythmias include ventricular fibrillation and ventricular tachycardia. Arrhythmias are due to problems with the electrical conduction system of the heart. Arrhythmias may occur in children; however, the normal range for the heart rate is different and depends on age. A number of tests can help with diagnosis including an electrocardiogram (ECG) and Holter monitor. Most arrhythmias can be effectively treated. Treatments may include medications, medical procedures such as a pacemaker, and surgery. Medications for a fast heart rate may include beta blockers or agents that attempt to restore a normal heart rhythm such as procainamide. This later group may have more significant side effects especially if taken for a long period of time. Pacemakers are often used for slow heart rates. Those with an irregular heartbeat are often treated with blood thinners to reduce the risk of complications. Those who have severe symptoms from an arrhythmia may receive urgent treatment with a jolt of electricity in the form of cardioversion or defibrillation. Arrhythmia affects millions of people. In Europe and North America, as of 2014, atrial fibrillation affects about 2% to 3% of the population. Atrial fibrillation and atrial flutter resulted in 112,000 deaths in 2013, up from 29,000 in 1990. Sudden cardiac death is the cause of about half of deaths due to cardiovascular disease or about 15% of all deaths globally. About 80% of sudden cardiac death is the result of ventricular arrhythmias. Arrhythmias may occur at any age but are more common among older people. Coronary artery disease, also known as “ischemic heart disease”, is a group of diseases that includes: stable angina, unstable angina, myocardial infarction, and sudden cardiac death. It is within the group of cardiovascular diseases of which it is the most common type. A common symptom is chest pain or discomfort which may travel into the shoulder, arm, back, neck, or jaw. Occasionally it may feel like heartburn. Usually symptoms occur with exercise or emotional stress, last less than a few minutes, and get better with rest. Shortness of breath may also occur and sometimes no symptoms are present. The first sign is occasionally a heart attack. Other complications include heart failure or an irregular heartbeat. Cardiac arrest is a sudden stop in effective blood flow due to the failure of the heart to contract effectively. Symptoms include loss of consciousness and abnormal or absent breathing. Some people may have chest pain, shortness of breath, or nausea before this occurs. If not treated within minutes, death usually occurs. The most common cause of cardiac arrest is coronary artery disease. Less common causes include major blood loss, lack of oxygen, very low potassium, heart failure, and intense physical exercise. A number of inherited disorders may also increase the risk including long QT syndrome. The initial heart rhythm is most often ventricular fibrillation. The diagnosis is confirmed by finding no pulse. While a cardiac arrest may be caused by heart attack or heart failure these are not the same. Prevention includes not smoking, physical activity, and maintaining a healthy weight. Treatment for cardiac arrest is immediate cardiopulmonary resuscitation (CPR) and, if a shockable rhythm is present, defibrillation. Among those who survive targeted temperature management may improve outcomes. An implantable cardiac defibrillator may be placed to reduce the chance of death from recurrence. In the United States, cardiac arrest outside of hospital occurs in about 13 per 10,000 people per year (326,000 cases). In hospital cardiac arrest occurs in an additional 209,000Cardiac arrest becomes more common with age. It affects males more often than females. The percentage of people who survive with treatment is about 8%. Many who survive have significant disability. Many U.S. television shows, however, have portrayed unrealistically high survival rates of 67%. A congenital heart defect, also known as a “congenital heart anomaly” or “congenital heart disease”, is a problem in the structure of the heart that is present at birth. Signs and symptoms depend on the specific type of problem. Symptoms can vary from none to life-threatening. When present they may include rapid breathing, bluish skin, poor weight gain, and feeling tired. It does not cause chest pain. Most congenital heart problems do not occur with other diseases. Complications that can result from heart defects include heart failure. The cause of a congenital heart defect is often unknown. Certain cases may be due to infections during pregnancy such as rubella, use of certain medications or drugs such as alcohol or tobacco, parents being closely related, or poor nutritional status or obesity in the mother. Having a parent with a congenital heart defect is also a risk factor. A number of genetic conditions are associated with heart defects including Down syndrome, Turner syndrome, and Marfan syndrome. Congenital heart defects are divided into two main groups: cyanotic heart defects and non-cyanotic heart defects, depending on whether the child has the potential to turn bluish in color. The problems may involve the interior walls of the heart, the heart valves, or the large blood vessels that lead to and from the heart. Congenital heart defects are partly preventable through rubella vaccination, the adding of iodine to salt, and the adding of folic acid to certain food products. Some defects do not need treatment. Other may be effectively treated with catheter based procedures or heart surgery. Occasionally a number of operations may be needed. Occasionally heart transplantation is required. With appropriate treatment outcomes, even with complex problems, are generally good. Heart defects are the most common birth defect. In 2013 they were present in 34.3 million people globally. They affect between 4 and 75 per 1,000 live births depending upon how they are diagnosed. About 6 to 19 per 1,000 cause a moderate to severe degree of problems. Congenital heart defects are the leading cause of birth defect-related deaths. In 2013 they resulted in 323,000 deaths down from 366,000 deaths in 1990.